When I was growing up the Chia Pet was a big deal and almost everyone was familiar with the catchy cha-cha-cha chia jingle that was part of the ad on TV. Well, chia has grown up (me too! :-)) and is now recognized as the superfood it truly is and not just something for creating a kitschy plant for the windowsill…. A new type of superfood receiving a lot of attention these days is salba—also known as white chia seeds. It contains 6 times more calcium than whole milk, 15 times more magnesium than broccoli, 3 times more anti-oxidant power than fresh blueberries, more fiber than flaxseed, and more protein than soy. Wow! So why are we just now hearing about this grain that was once prized more highly than gold by the ancient Aztecs? They fed it to their athletes, used it as medicine, and even offered it to their gods. But then the Spanish conquistadores arrived on the scene, and for the next five centuries salba somehow became just a colorful legend. But now that modern researchers have rediscovered the remarkable properties of this nutritional powerhouse, it’s beginning to show up again everywhere. They’ve found that, gram for gram, salba has 8 times more Omega-3 fatty acids than fresh Atlantic salmon, so it’s a real winner for promoting a healthy cardiovascular system and heart function. And it helps maintain good cholesterol and keep your blood pressure where it should be. Salba energizes you honestly, too, unlike many energy drinks that are just “caffeine in a costume” that can cause a blood sugar crash later. Plus, it’s high in fiber—you’d need to eat 1 ¾ cups of bran to get the fiber that’s in just a few ounces of salba. But salba isn’t just one of the richest whole-food sources of fiber on the planet. Each tiny granule is packed with two types of fiber, in ideal balance. Salba’s insoluble fiber gently “scrubs” debris and toxins from your colon walls, alleviating problems with constipation, build-up and blockage. And its soluble fiber soaks up water, so that loose stools and diarrhea are avoided. When you’ve got both kinds of fiber working in perfect balance, food moves through your digestive tract and bowel calmly and cleanly. Hallelujah! The fiber also slows down your digestion, so your body has a chance to absorb more nutrients, and you feel full longer, which helps with weight. Salba’s fiber also works to even out your absorption of carbohydrates, so your cells get a slow, steady supply of fuel and no blood sugar spikes. And salba’s flavor is neutral, so it “disappears” when you stir it into your favorite breakfast food or smoothie. You can also mix it into baked goods, casseroles, and more. It has a shelf life of 5 years, and even if you grind it, it stays fresh in the refrigerator for up to 3 months. But it’s only the white strain of the grain, and not the black, that happens to possess all of these health-giving properties, so be sure that’s the type you buy. FYI, I actually wrote the above information about 5 years ago when I was putting together a health book and salba/white chia was just starting to gain a reputation as a superfood. A few years later I started noticing that I heard and saw less of the salba and more of the black chia. Since initially there was only one brand/company that offered salba, I started to wonder if maybe I’d been overly influenced as to salba/white chia’s superiority to the black by their marketing campaign rather than hard facts. So I recently did some research and here’s what I found….it’s an excerpt from an article on the very topic by Paul E that I found on http://www.naturalremi-teas.com…. I had a chance to talk with Marion Gray at natural Remi-Teas that has been retailing chia for several years, and ask her opinion. She shares the same feeling – that white and black seed are very close in nutrition, as the black has a tad more antioxidants than white, but white has a bit more protein and milder flavor. “There have been a lot of discussions regarding the various seeds being sold (black, the all-white, and the variegated mixed variety). However, they are all Salvia Hispanica L. varieties and, depending on the area grown, there is very little difference. They are all the same botanical variety. There is another botanical variety, the Salvia Columbariae, which has different characteristics. Nutritionally, they are very similar, used by the North American aboriginal tribes. Both varieties are from the mint family. However, the Salvia Hispanica L. variety is a tall mint-like plant with long extended purple flowers (black variety) and white flowers (white seed variety) and they have been domesticated for variety) and white flowers (white seed variety) and they have been domesticated for farming. The Columbariae variety is a small, three-tiered thistle which has purple-colored flowers, predominantly in the Southwestern regions of North America, and it was strictly a wild crafted seed. In conclusion, in my view, black and white seed are very close in nutrition and as William Anderson states, climate and conditions of crops vary. Without some extensive long-term studies, it is not easy to favor one over the other. The good news is that chia seed is a very nutritious food, black or white. Chia seeds are the new quinoa. The new ingredient to wriggle its way into the mainstream after a few decades as the fibrous, whole-mealy staple of the granola belt. I know many of you out there are still trying to work out what to do with them once you’ve bought a packet. And since I hate the idea of anyone buying a packet of anything and having it sit there going to waste, henceforth a wee list of clever applications. I’ve written on why chia seeds are so healthy before. Amongst many things. they’re godsends when you’re quitting sugar. They help to control your appetite because they fill you up (with the addition of liquid they swell to 17 times their original size) and they’re a fabulous source of protein. They’re also full of nutrients – vitamins A, B, D, E, calcium, potassium, iron, magnesium – which help with the detox hell that some can suffer. Substitute 1 tablespoon of chia seeds (preferably finely ground) + 3 tablespoons of water per egg. If you don’t want to use cornstarch or other thickening agents, add a teaspoon of chia seeds or chia bran at a time until you reach your desired thickness. Bear in mind it takes a minute or two for the seeds to swell and work their magic. Be patient! 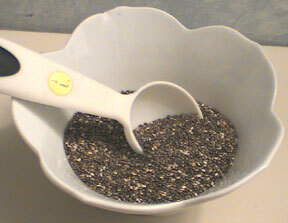 Sprinkle a thin layer of seeds on the bottom of an unlaquered terra cotta dish or plate. Put the terra cotta dish in a larger plate of water. Day 2, lightly mist the seeds (or sprinkle) with water. Day 3, they should be right to eat. Throw in a few tablespoons of protein powder while you’re at. Just mix coconut water and some seeds to form an electrolyte-laden “goo”. I got my Dad onto this. He runs marathons and does 24-hour mountain bike races and swears by the idea (and he’s a hard guy to get on board!). It’s infinitely better than the commercial goobs and energy drinks. Cooking with a slow cooker can often leave you with a lot of excess liquid. I do two things. The first: I thicken the sauce by adding some seeds or chia seed bran. The second, I remove any excess liquid (a very brothy, nutritious mixture) and put in a jar with some chia seeds and then eat with toast, over rice, pasta or vegetables. Add chia seeds to beaten eggs, soak for 10 minutes and turn into an omelette or frittata. Add ground seeds to nut butter and amp the nutrition. Or add to butter with some cinnamon and spread on hot toast. Add 1/2 cup of chia seeds to 1 1/2 cups of almond or cashew milk. I make mine in a jar and carry it to the office, or on planes when I’m travelling. It’s filling, can be made the night before and is spill-proof! Do you have any chia wisdom to share? Feel free to add your comments below. And check out my post on the benefits of black cumin seeds; they’re super good for you, too! p.s. Be sure to subscribe to Self-help Health so you don’t miss any future posts. Also check out the To Your Health page at my website Evolution Made Easier and blog of the same name for more helpful information, tips, tools and resources.